The President of the Republic of Liberia, His Excellency George Manneh Weah is seeking Nigeria’s assistance to help jump-start Liberia’s economy which he said is urgent and critical. A release from the Liberian Embassy in Abuja says President Weah named Liberia’s educational, agricultural, mining, health and private sectors as being in urgent need of assistance. According to the release, the Liberian President made the remarks on his first day of his two-day state visit to the Federal Republic of Nigeria as he addressed a media stakeout following closed-door bilateral discussions he held with the Nigerian President, His Excellency Muhammadu Buhari. “Your Excellency, we need Nigeria’s help to jump-start our economy”, the Liberian Leader told his Nigerian counterpart during the media stakeout held at the Aso Presidential Villa in Abuja on Monday, March 5, 2018. President Weah said his administration’s ‘Pro-Poor Development Agenda’ is intended to tackle the many economic and social problems that his Government has inherited. He said his Government needs to especially address the large fiscal and infrastructure deficits, the urgent problem of youth unemployment, and reviving the education, agriculture, mining and health sectors. “More specifically, under the Bilateral Teacher Exchange Program, we are seeking 6,000 plus teachers to make up for the shortage of good teachers in our educational system”, President Weah added. The Liberian Leader told President Buhari that Liberia’s agricultural sector seeks experts and extension workers to build capacity in the sector, particularly with crops (such as cassava, for example), which lend themselves readily to value-added propositions and export earning potential. Acknowledging major shortcomings in the electricity and power sectors as well as in road construction, housing, mining and in fisheries, among others, the Liberian leader therefore declared that Liberia is now open for business to the Nigerian private sector. “Your sustained technical assistance for capacity building in these sectors is most welcome”, he remarked. President Weah spoke of the need to address the current volume of trade between our two countries, which he said is very low and does not exceed $5 million, by some estimates. 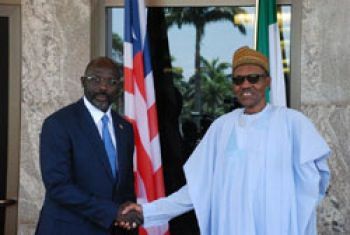 Earlier, President Weah described his visit as a mission of gratitude and respect for Nigeria’s extraordinary and exceptional role it has and continues to play in maintaining peace and stability in the West African sub-region and Liberia in particular. The Liberian Leader recalled Nigeria’s major role played in bringing peace to Liberia. “You reformed our army and today it is performing its duties to the highest professional standards. As we speak, they are serving in a peace-keeping mission in Mali”, he stated. President Weah’s delegation includes the Ministers of Finance and Development Planning, Honorable Samuel D. Tweah, Jr, Information, Culture and Tourism, Honorable Lenn Eugene Nagbe, National Defense, Honorable Daniel Ziahnkan and State Without Portfolio Honorable Trokon Kpui, the release concludes.